It appears former UFC light heavyweight champ Lyoto Machida isn’t the only MMA fighter with a peculiar diet. Strikeforce’s Alistair Overeem claims there is nothing better than some good ‘ol fashioned horse meat to pump your body full of protein. Overeem will finally put his heavyweight title on the line when he meets Brett Rogers tonight at “Strikeforce: Heavy Artillery.” Although he captured the belt back in November of 2007, Overeem has never been back to defend his crown. 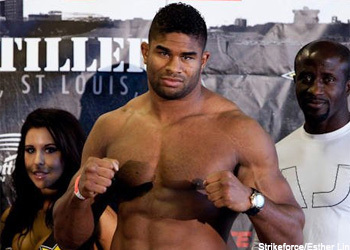 Compounding matters was the undeniable ballooning of Overeem’s overly-chiseled physique. Most within the industry have questioned the legitimacy behind achieving that kind of natural growth in such a short period of time. In Overeem’s interview with MMAFighting.com, he tells Ariel Helwani that he loves him some horse, however it’s a little expensive to eat on a regular basis. Also, the champ was under the impression that consumption of horse meat in the U.S. was illegal, however Answers.com states it is not.